During the Civil War, most canons were smoothbore (no rifling), which tended to limit range and accuracy. One notable exception was the Parrott Rifle, which came in a number of different calibers from mobile field pieces to heavier immobile defense pieces used on fortifications. The gun was invented by Captain Robert Parrott, a West Point graduate. He created the first example in 1860 and patented the design in 1861, just in time for the “festivities” we call the American Civil War. They were manufactured as a combination of cast and wrought iron. Because of the increased resistance of the rifling slowing of the projectile’s trip down the barrel, higher pressures were generated than in smoothbore canons. As a result bursting at the breech end was a problem. This was solved with the addition of a large wrought iron band added over the breech end of the gun. This can be seen at the back end (breech end) of the guns in the two attached images. This is a distinguishing feature of the Parrott Rifles. The band was heated red hot and slipped on while cold water was poured down the bore of the gun as it was being rotated. This ensured uniform attachment of the band to the gun. The Parrott was used by both sides in the war and came in different sizes from 10 pounders (weight of a bore size round iron projectile) to rare 300 pounders. For the largest field piece, the 20 pounder, the gun alone weighed 1,800 pounds. The gun rested on a two-wheeled gun carriage. Its trail was attached to a two-wheeled limber for transport and drawn by a team of horses. Ammunition, fuses, sights, and its friction priming device were carried in the limber, which was positioned well behind the gun when deployed for action. Additional ammunition was carried in caissons, which replenished the limbers in a fight. The crew usually consisted of eight men, and each had a specific job when fighting the gun. They rode the gun’s horses and on the limber when transporting the gun. A battery usually consisted of four guns, but was fewer in many cases. Ammunition consisted of solid shot, exploding shell, and canister or grape shot. The exploding shell had a timed fuse set by the crew to explode on arrival at the target. Grape shot and later canister consisted of a “package” of round cast iron balls about 1” in diameter. It can best be described as resembling shotgun buckshot ammunition but a lot bigger. It was used at relatively short ranges against charging infantry. You can see the awful effects of canister in some scenes of Pickett’s Charge in the movie Gettysburg, a classic Civil War movie. Look for the scenes where the canister takes out dozens of charging Confederates as they cross a fence. It takes out the fence, too. 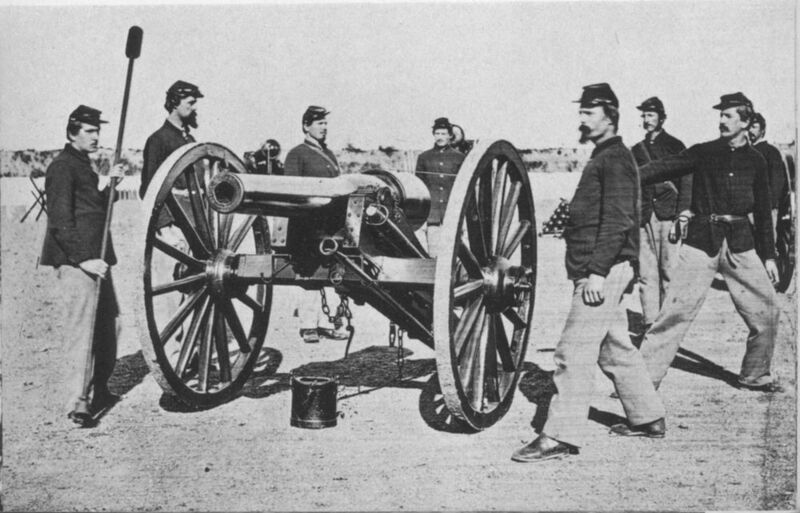 Captured guns were a great prize during the war, especially for the equipment-short Confederates. And with the advent of rifled muskets, increasing their range and accuracy, the gun’s crews and horses became prime targets. If the crew was killed or wounded, the gun was out of action. If the horses were killed, the gun could not easily be repositioned or removed from the field, lending them to the possibility of capture. There is a scene in An Eternity of Four Years that took place at the Battle of Port Republic during Jackson’s Shenandoah Valley Campaign of 1862, when the Louisiana Tigers were tasked with capturing some particularly troublesome guns that had a high-ground position sweeping the battlefield with their accurate fire. 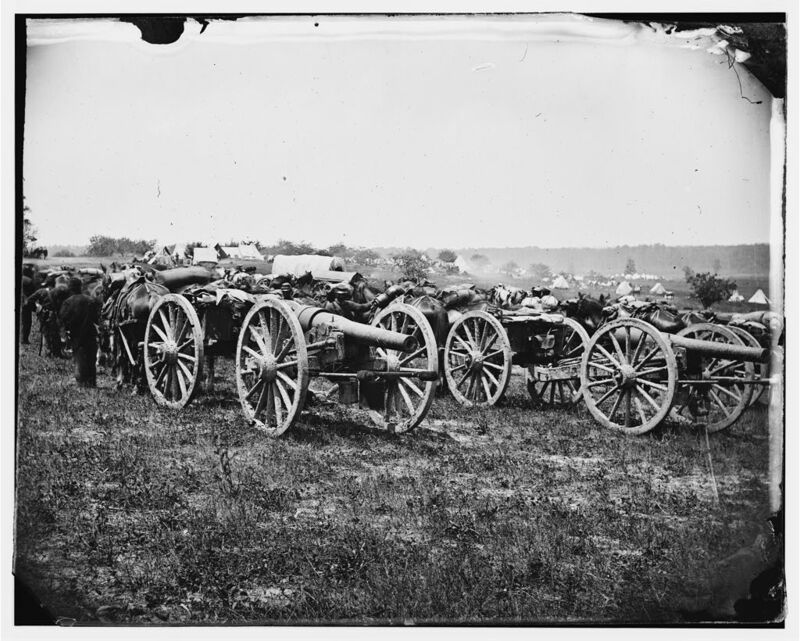 When the Tigers took the position, capturing the guns, and were in danger of being repulsed, they slaughtered the artillery horses to prevent the guns from being moved. That actually happened in that engagement, by the way. The Civil War was generally fought with the linear battlefields of previous wars; that is regiments, divisions, and corps lined up facing each other and blazed away. The smoothbore muskets were not very accurate and hitting a man at 100 yards was pretty iffy, thus the need for massed fire. Throw enough lead at them, and you are bound to hit something. Unfortunately, that required massed troops, making them easy targets for the other guy’s massed fire. With the advent of rifled muskets and the rapid reloading Minié ball, all that changed, and casualties went up dramatically. The same held true for canons, which were generally placed to the rear of the infantry. The added range and accuracy of the rifled muskets and field guns made those obsolete tactics suicidal.